I’m no photographer, but, through the miracle of digital photography, I’ve found that if you take enough photos, there’s bound to be a few that don’t turn out that bad. Those of us of a certain age will recall taking our film rolls to the local drug store, waiting a few days for development, and then going back to pick up our pictures to discover what those photographs looked like. Most often, mine looked like crap. Out of a couple dozen pictures taken during a summer vacation, two or three weren’t blurry. Now, of course, we have the luxury of deleting the crappy photos before sharing them with others and we don’t have to pay for our prints sight unseen. With the dawn of cheap digital photography, everyone has become an amateur photographer. The younger set tends to document every moment of their lives–whether notable or not. Women of my age are most likely to photograph our children. My five-year-old is one of the most documented little boys around. The number of his childhood pictures will dwarf the number that my mother took of me. And then there is the doll collecting set. We love to take and share images of our dolls. Mostly, I believe, because there are so few of us, and we rely on the Internet to bring us into contact with one another. Online, we can share pictures of our latest discoveries and learn about new dolls and upcoming artists. Some of today’s doll photography is an art in and of itself. Nearly every day I come across some new doll imagery online that leaves me scratching my head, thinking, how did she do that? My own photos are amateurish at best, but once in a while the photography gods align around me and I take a pretty decent image. Prego, one of the doll boards that I frequent, adopted the theme of doll photography this week, asking members to post some of their favorite photos. I was inspired to dig into to my 10+ years of collected doll photos to locate some of my favorites. Doubtless this will be a trip down memory lane for some of you more seasoned Tonner collectors. Looking back on the many, many images of dolls that I’ve taken throughout the years, I’m reminded of how much pleasure this hobby has given me, how much it continues to give, and how much more I’m sure it has in store. Like many people, my picture-taking skills are confined to the point-my-camera-at-something-pretty (usually my son), press-the-button, and hope-something-turns-out variety. In all of my 22 years of collecting dolls and photographing them (jeez, I’m old), it’s never gotten more sophisticated than pointing and shooting. I began taking pictures of my dolls back in the Dark Ages, when people actually had to drop rolls of film off at the pharmacy, wait three days, and then pick them up. It was not uncommon to spend $15 to get a role of 24 photos developed only to find about three that were half-way decent. I recently came across some of those decades-old photos while cleaning out my garage. I uncovered dozens and dozens of blurry doll pictures. I hate to think how much I had spent on getting that crap developed. Nevertheless, those blurry pictures brought back memories, and it really hit home how long I’ve been in this quirky little hobby of mine. When I took my earliest doll photos, I was living in a college dorm room. And now I’m a middle-aged soccer mom in Florida balancing a full-time corporate career I never imagined myself in with raising a gorgeous, precocious little boy. I had plans after cleaning out the garage to photograph a new doll that had arrived that morning. Those decades-old, blurry photos served as a reminder that 20-year-old Barb and 42-year-old Barb were enjoying the same hobby. Reflecting on that, I realized that dolls were probably all those two people had in common any longer. Life had changed me. But–for better or worse–I retained my passion for dolls. So I tossed those blurry photographs back into the box I found them in so 52-year-old Barb can discover them again and reflect on her life as a doll collector and the mother of a teenage boy. Will she still be as passionate about the art of doll-making and see beauty in miniature sculpture and couture? I’m guessing so. For many of the most committed doll collectors and artists I know, this is a life-long passion. The photos I found inspired me to push myself a little to see if I could improve my picture-taking skills just enough to do some justice to the dolls I was photographing. So I visited eBay and selected a backdrop to scale with 16″ dolls that cost me $17.25 (shipping included). It took two weeks to arrive from Shanghai. The backdrop arrived rolled in a tube. The image was printed on a durable fabric parchment. Well worth the price. I took the backdrop into my son’s room in the afternoon, just when it is filled by afternoon sunlight. I taped the backdrop to the wall behind his dresser and arranged a couple dolls selected for the occasion. Then I took my camera phone and started experimenting. “Alma” by Paul Pham and “Riley” by Helen Kish. 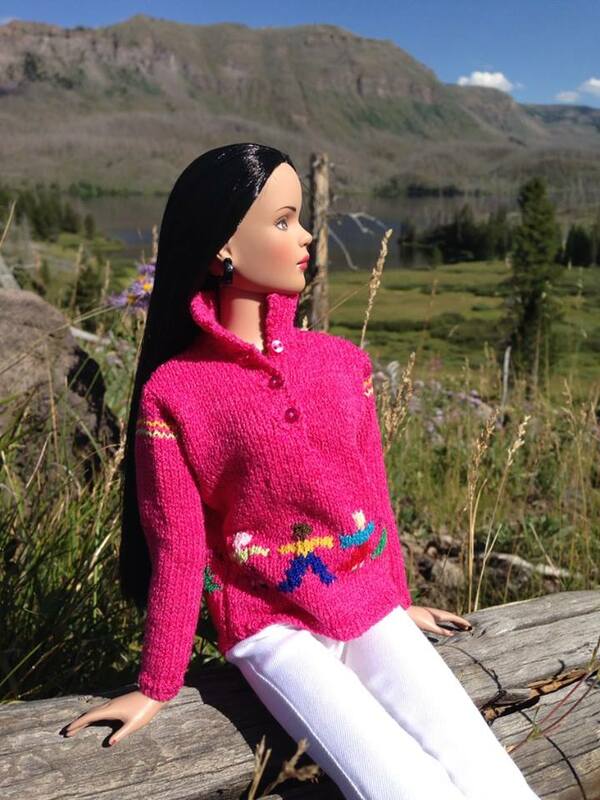 Alma wears Stratus’ wig, her original earrings, and a sweater and slacks by Tonner. Riley wears Boneka. These were the best four out of the dozens of shots that I took. My biggest mistake, I see, was in my placement of the backdrop. In this setup, I’ve hung it too high, so the floor begins on the wall. It also might have helped to move my subjects back a bit to enhance perspective and place them deeper into the scene. Once I cleared up my photo shoot, I got to tinkering around with Alma’s wardrobe, and I found a Gene outfit (“White Hyacinth,” I believe) that went beautifully with her complexion. Rather than set up my backdrop again, I just shot a couple of photos of Alma on her shelf. I friggin’ love this doll. She looks amazing in anything. Anyway, such went my first foray into putting some actual effort into capturing the beauty I see when I look at my dolls. I invested in a couple of books about doll photography a while back, and I’m going to dig them out and see if I can make some more progress. Stay tuned. And Happy Valentine’s Day! The Tonner Doll Company released photos of its “mainline preview” this week. Apparently, the balance of the 2015 mainline release will be announced sometime in March. According to the company, March’s release will include dolls from the Patsy, Patsyette, American Model, DC Stars, Sindy, Déjà Vu, and much-anticipated Marley Wentworth lines. And, lest I forget, I hear that there will be new Wizard of Oz dolls. Again. No one knows how to wring the value out of a commercial license like Robert Tonner. Of the 15 dolls that Tonner announced this week, 12 are now available for shipping—a huge improvement over having to wait for the vast majority of the dolls to arrive from a slow boat from China by dubious arrival dates. This also marks the first time Tonner’s release of licensed dolls based on characters from a contemporary movie will actually be ready for shipping while the movie is still in theatres. (Well, at least two dolls will. The third seems to still be pending approval.) So, even if the film tanks, there is a chance the dolls will sell on at least the premise of Jupiter Ascending being a good film. Besides the three Jupiter Ascending dolls, also released were an impressive seven dolls from the Diana Prince collection, which features the popular Tyler 2.0 sculpt and reimagines Wonder Woman as a fashionable woman about town. This clever recasting of Diana Prince makes her potentially appealing to both comic book geeks and fashion doll collectors. I personally know at least one of the latter who will be adding a Diana Prince doll to her collection. Rounding out the preview are one Tiny Kitty, two Scarlett O’Haras, one Wicked Witch (probably edition number 459, but who’s counting? ), and a resin Snoopy and Belle gift set. Not sure what market Tonner is targeting with that last one. My general impression of the preview is positive, and I’d like to call attention to three products that I particularly like. But before I do, I really need to get something off my chest. My chief critique of this collection has nothing to do with the dolls themselves. It is the way they are presented. Tonner Doll Company’s inadequate photography of its products does a huge disservice to collectors, and, of course, to the company itself. With the near-eradication of the local doll shop, collectors no longer have the luxury of being able to personally handle and evaluate dolls before they purchase them. Collector fashion dolls are expensive—and they are getting more so. Plunking down $200 for a purchase sight unseen takes quite the leap of faith. With less and less discretionary income available to the middle class, the concept of “pre-ordering” has become almost quaint. Many collectors now reserve judgement until they review IRL (“in real life”) photos of dolls that have already been purchased by other collectors who are kind enough to share their personal photos. Under these circumstances, manufacturers can become hugely dependent on the picture-taking skills of anonymous collectors to sell their wares. After investing countless dollars on creative talent, manufacturing costs, and ever-rising overhead, why in the world would any company allow their sales to depend on homemade photos shared in online collector groups? The transformation of doll commerce from brick-and-mortar to online stores has made it incumbent upon manufacturers to try to replicate the in-store shopping experience online via high-quality, multiple, detailed photographs. And that doesn’t mean taking one front-view photo of a doll and then using close-ups of that same photo for your detailed photos. Show me that your product is worth my $189.99! Take off that coat. What’s under it? Is it lined? Does the dress come with a slip? Are there crinolines under that gown? Pick up that long hem and show me the shoes! Do they zip up, or do I have to fumble around with tiny buckles? What is the quality of that fabric? Are the beads sewn on? How thick is that sweater? What does the jewelry look like? All of these factors can be make-or-break for different collectors. You may very well list what your outfits do or do not include in your product descriptions, but telling me that there are “white faux leather pumps” under that long gown does nothing to help me know what they actually look like. A short time ago, Tonner Doll Company did begin posting short videos of its dolls taking a 360-degree turn. I was delighted to see that, but the effort was short-lived, and the videos were too small to see any real detail. Mr. Tonner, you can make it wholly unnecessary for collectors to wait to see the snapshots other collectors have taken of their dolls—and you can sell more dolls in the process—by taking high-quality, detailed photos of your production dolls when they are ready for shipping. Your photos are the only thing left on which your potential buyers can base their purchasing decisions. Don’t make it an afterthought. Pay a good photographer and stylist well, and you will see a handsome return on your investment. To borrow an overused phrase, this is not rocket science. Integrity Toys has managed it for years. Each time they announce a doll, collectors are provided multiple detailed photographs from multiple angles as well as up-close photos of the doll’s accessories. This has allowed the company’s collectors to make more informed purchasing decisions, leading to fewer cases of “buyer’s remorse” that can result in returned products. Sermon over. I’ve been holding that one in for a while. Back to the preview. My main pick of this group’s litter is Jupiter Ascending, a doll based on the character and movie of the same name. I am not a sci-fi fan, and I have no idea who Mila Kunis is. I do know that I love the sculpt, and that getup looks like runway couture at its best. I want one. Then there’s the “Winter Princess” outfit. Although it is quite similar to Diana’s outfit, I can never resist a good coat dress. From what I can see of it, this is classic Tonner style at its best. But it would really, really be super to know what the coat looks like without the scarf on. Does it have a wide collar? A narrow one? Is the belt attached? And, please, let’s get a look at that damned purse! Other items that interest me (at least what I can see from the single photo that Tonner offers), include Diana Prince’s “Stars and Stripes” outfit and a darling little Tiny Kitty. The entire preview can be viewed here. What are your favorites?